Mistakes are Inevitable. It’s Time to Forgive Yourself. Please forgive yourself. It’s time. Mistakes are inevitable, a part of life, yet we still beat ourselves up about them. The best thing – the most healthy and loving thing – you can do is forgive them. Don’t sabotage your success by holding the mistakes of the past over your head. Repeat this affirmation daily, as a reminder. I also recommend the The Forgiveness Diet, an exercise from the book A Course in Miracles. I wrote about it and shared my experience doing it on the blog a couple of years ago (a snippet of what I said is below). 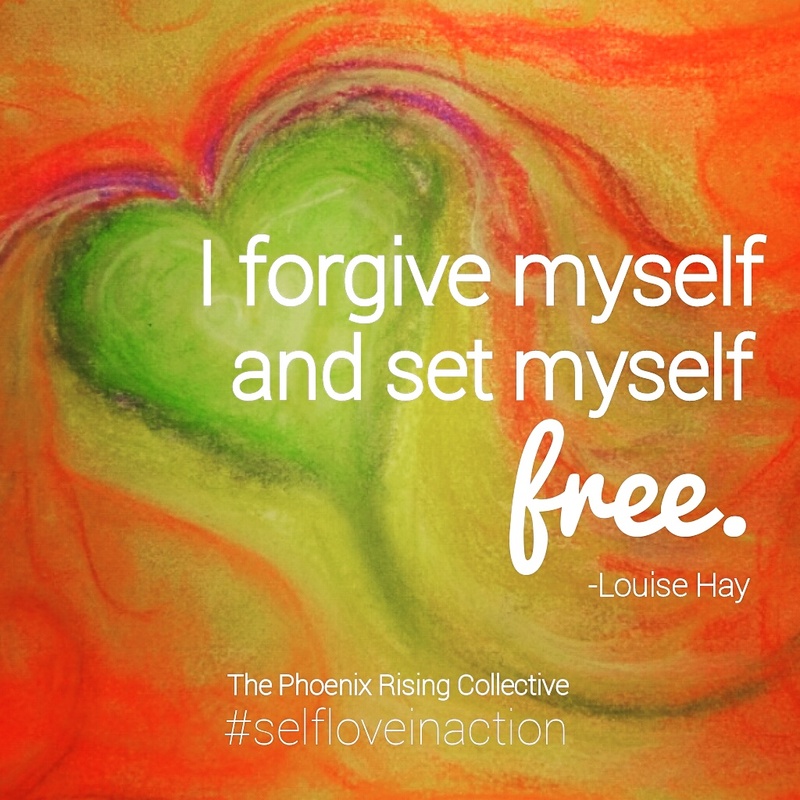 It was important for me to start this exercise again because I did not want an inability to forgive myself (or others) hindering my success or sabotaging my commitment to live in the fullness of who I am. The Diet says to the ego, “I am well aware that the culmination of my past experiences has prepared me for what I am embarking on now. All is well. After completing the exercise, I’d love to hear your thoughts on how the experience was for you. Share in the comments. Continue being self-love in action. Ayanna Jordan is founder of and leadership development coach & trainer for The Phoenix Rising Collective. She develops and facilitates women-centered workshops on how putting self-love into action can transform your life. Ayanna also creates coaching and training that supports women’s professional growth in leadership, entrepreneurship, and passion-filled work. As editor-in-chief of Phoenix Shine, she is happy to be working with contributing writers to provide resources and awareness on topics that cultivate self-love and acceptance. Right now, she is most inspired by the LYFF series and She Makes It Beautiful. You can learn more about Ayanna HERE. Categories: Affirmations | Tags: A Course in Miracles, forgiveness, personal growth, self-care, self-care rituals, The Forgiveness Diet | Permalink. There is nothing you need to prove for acceptance. You are worthy just as you are in this present moment. STOP thinking you have to be something other than who you are and/or do something differently. You are enough right now. Act in this belief every day and your experiences and the people around you will shift to support it. You are worthy! Categories: Affirmations | Tags: Affirmations, self-acceptance, self-love, the phoenix rising collective, worthiness | Permalink. You are a creator, a conjurer, a maker, a doer. It’s time for you to use your power to manifest absolutely great things in your life. Categories: Affirmations | Tags: Affirmations, empowering women, intention, manifesting, self-confidence, self-esteem, self-love, the phoenix rising collective, women and self-love, women's empowerment | Permalink. There is freedom in letting go. Stop beating yourself up already! Stop holding on to old wounds, things you should or should not have done and said, etcetera, etcetera. Blaming and shaming will not change what happened to you or what you did and said to yourself or someone else; however, releasing the pain around the experiences will support healing and moving on with a newfound sense of freedom. There’s a beautiful book by author and life coach, Iyanla Vanzant, that I’ve had for a long time (long enough for the pages to turn yellow), Tapping the Power Within: A Path to Self-Empowerment for Women. I found this book (or it found me) years ago when I worked in a bookstore and was also becoming much more diligent in my spiritual development. I loved the self-care rituals in it (and still do). It’s an easy read with powerful step-by-step guidance that can be used every day. Let’s be real, guidance on how to let go and forgive is the challenge, so being armed with tools that support practicing forgiveness makes all the difference in the world! I hadn’t opened Tapping the Power Within in quite a while but found myself drawn to it again about three years ago – right around the time I took the major leap to start The Phoenix Rising Collective. I began to doubt that I could create something of this magnitude on my own from square one. And you know what happens when doubt rears its ugly head? Its companion, negative self-talk, is just around the corner ready to pounce with questions like, “Who in the world do you think are? What makes you think you’re qualified to do this? What if you fail?” Once that starts I’m in the rabbit hole called The Past – past hurts, past pains, and past failures. A close friend and I hold each other accountable when we go to that dark place by saying, “Get outta there! Come back. That’s over. Be present.” We’ve all got our own personal rabbit hole, and the key to digging your way out and keeping it closed is self-awareness: developing the ability to catch negative self-talk when it begins, understanding what triggers it, and committing to practices that heal and create change. So, with that in mind I took Tapping the Power Within off the shelf for a refresher course and immediately turned to the chapter on forgiving and releasing. This is the paragraph that struck a cord: “The Forgiveness Diet included in A Course in Miracles, is a helpful exercise for releasing past hurts, those you remember and those you do not. It requires a commitment of 20 minutes in the morning, 20 minutes at night, and a brand new notebook.” Well, I grabbed my journal and went on a diet. Two major things that I noticed after completing the exercise were 1) the inner chatter dissipated and I was able to easily replace it with more loving thoughts and affirmations, and 2) I physically felt lighter (when I am thinking about hurtful past experiences I usually carry the emotional load on my shoulders and upper back). My challenge to you is try this exercise! I’ve even attached the instructions: The Forgiveness Diet. This will be another productive, spirit-affirming tool to pull out of your I-am-a-self-care-goddess kit, a part of your guidance on how to forgive yourself and others when the need to do so strikes. Be open to the experience. Remember to give yourself grace throughout the process, and if you have to start over, then start over – as many times as necessary. This is your opportunity to let go of whatever you’re holding on to. It’s your chance to finally let it fall away. Release the weight. Be light. Be self-love in action! And don’t forget to share your progress with me in the comment section below. What did you observe while on the diet? How did you feel? I’d also love to hear about your go-to books on and practices for forgiveness. Ayanna Jordan is founder and Women’s Leadership Coach & Trainer for The Phoenix Rising Collective; she is also the editor-in-chief for Phoenix Shine, The PRC’s blog and spirit-affirming online community. She has always had a passion for inspiring others through writing, coaching, and teaching. Her diverse career experiences have positively shaped her overall perspective on what it truly means to be a change agent: “I believe a change agent is someone who is in alignment with what she loves to do, and then connects, utilizes, and shares that love to make a difference and transform lives.” Learn more about Ayanna HERE. Categories: Affirmations, Self-Care + Personal Growth | Tags: Affirmations, forgiveness, intentional living practices, Louise Hay, personal growth, self-care, self-care books, self-esteem, self-love, The Forgiveness Diet, the phoenix rising collective, whole living | Permalink.